I have been considering freelancing a structure of wood with lots of detail clutter inside and out. I would like a wood floor and service pits and all the work benches, machines, and tools, maybe even a structure that has some strange additions that look a little questionalble. Why not do all of those? A stone EH is rare enough- it would be something quite interesting. I hope that I haven't broke any rules here by posting a picture of the kit, as long as I have credited it properly? By the way, that was a good tutorial on track weathering. I am going to use some of it. perhaps you could use the wall castings and re-arrange. I think you may be right, the stone engine house might be interesting enough to do what I want, but I may freelance the interior and have a wood floor with service pits instead of just an empty shed. I laid out the tracks and did a quick mock up and I am starting to like the way it looks. I was considering the Schomberg kit but it is has been compressed and I allowd for a full size structure. I also want to build the structure with an interior and the Schomberg kit has smooth interior walls. The frogs are solid and I am not cutting gaps because I am power routing the frogs and points from the switch machines. I have some photos of a turnout I am building that I will post after it is completed. 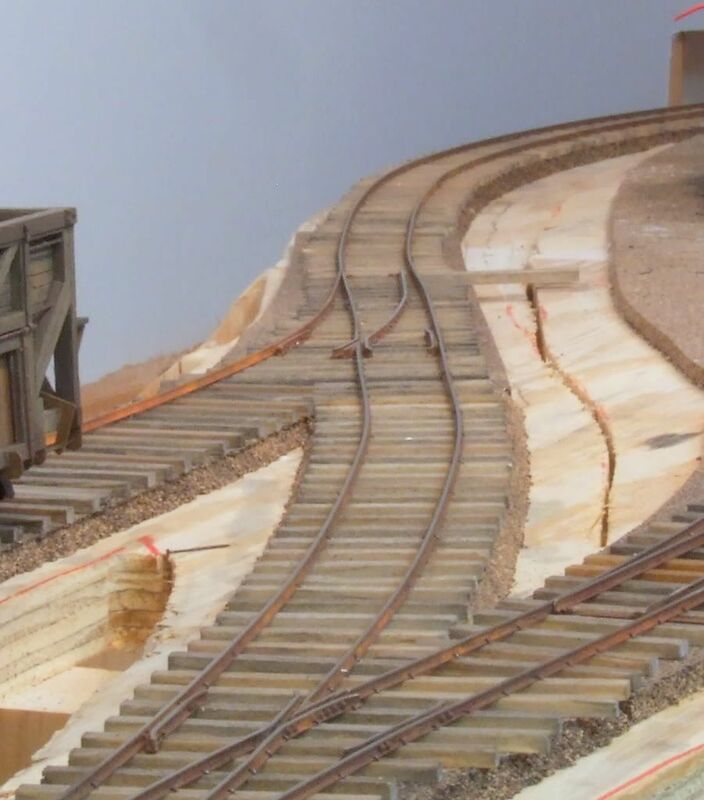 I am almost done with the track work in this area and have only two more staging turnouts to build to complete all the lower level track, I don't think the loop will get running by Christmas as I had planned but it is close. Using the Micro spikes have really slowed progress because I am having to learn how to start with them, whereas on the test section I already had the rails held in place and in gauge. Starting with micro spikes has challanges all it own that I am working on overcoming. today 1-4-11 at 5:40 pm the track crews completed the continuous running loop and the first train, Climax #5 and three freight cars made two laps! I am a few days behind my goal but with a few long spiking days I got it done. My fingers are sore but after seeing that first train run it was worth it. This is the first layout in 20 years that has a continuous loop. I am going to slow down a little bit now and stop layout work to get all my On30 stuff gauged to On3 and get a caboose built. After that I will get some scenery in around the dump are and build some structures before building phase two. I'll get some photos up soon. Congratulations Jeff!! That must have been very exciting seeing that first train run the loop. I can't wait for that moment on my future layout. Keep up the good work! And can't wait to see the pics. Congratulations on the milestone. I�m looking forward to seeing pictures of your progress. You handlaid all that hidden track? That's dedication, dude! Congratulations. here are the photos. The room is mess and a good cleaning is in order now that the dust has settled. since switching to the micro spikes my track laying speed has dramatically decreased on the visible areas, I am still using small spikes on the hidden tracks. To speed things up I have not spiked every tie with four spikes, I will go back and fill in the missing spikes and fix the areas where I had used the small spikes. the shay to the left is a 37 ton Kemtron shay that I am installing a new motor in and will be doing a total rebuild and detail on it. I am going to build a different cab and tender to resemble Mann's Creek #5 shay. I will also make it super heated. The shay to the right is #6 which started as a Bachmann On30 shay, I did a build post on in in the On30 forum when I was still building in On30. The shays are sitting where the engine house will be, the track that swings around it to the left will go through a deep cut that will hide it as it swings around to the right and to a switch that will go either to staging or to the branch up to the mine area. For looks I dipped the track down a little as it went around the engine house. The switch on the main line next the engine house will lead to the dump track. I will install a temporary track for a dump track until I can build the trestle to the dump shed. here is the staging yard. I only had enough rail to lay the mainline through the yard, I will pick up some more rail this weekend and get the yard operating. 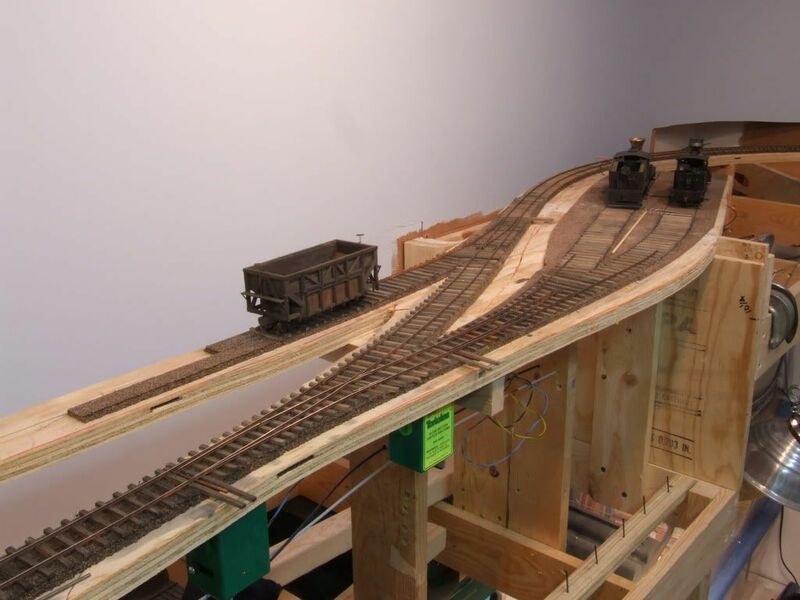 the hidden turnouts are build on PC board ties for durability, including the switch that leads to staging or the branch there are only five hidden turnouts, all #6.
here is a crappy quick video of Climax #5 making a pass by the coal dump trestle area. Jeff, you are doing great, like the video. You know most narrow gauge didn't use four spikes per tie, most didn't even use tie plates in an effert to save money. One thing I forgot to add about spiking the rail, I have been using some rolling rail gauges that Racedirector (Bruce) sent me and I really like them. At first I didn't use them for more than hold the rail in gauge away from the area that I was spiking because I didn't trust them and I wanted to see that I was spiking in gauge while holding an NMRA gauge, but after talking to Bruce I decided to trust them and use only the rolling gauges, now I really like them. what I like is that I can build the turnout at the bench over the template, unspike it and take it all apart for weathering. then I can use the roller gauges to hold all the parts in place over the wood ties while I drill the spike holes and get it all spiked down. I also like that the rollers hold the rail tight enough that I can move the rails around while they are being held in gauge and I can get a little "rail wiggle" in and see how it looks before I spike it down. 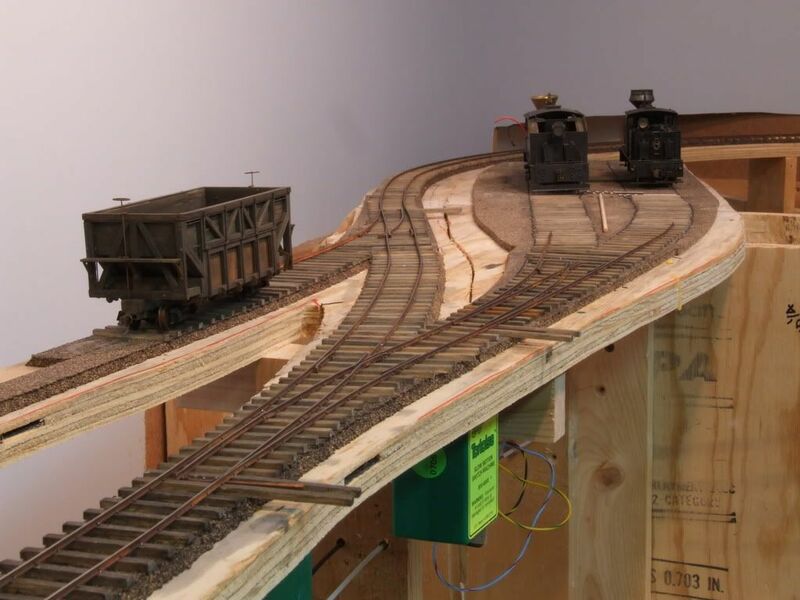 I wanted to get that look of wiggly narrow gauge track and I was having a hard time getting the right look spiking one rail at a time. 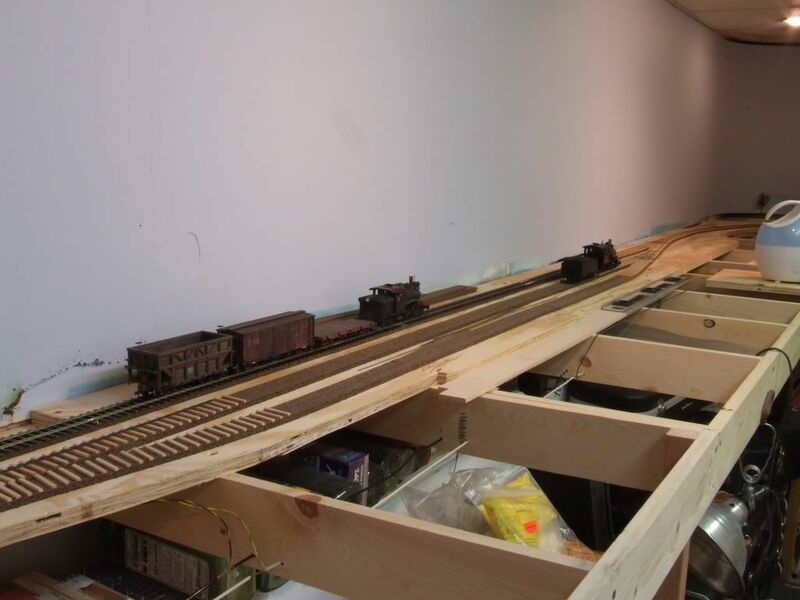 the photo below shows the look I was going for, all rail is in gauge and the train runs over this track smooth without a hitch, but a close up at eye level shows rail that wanders side to side, as if the ties are shifting. I really like the way the rail looks going through the far turnout. 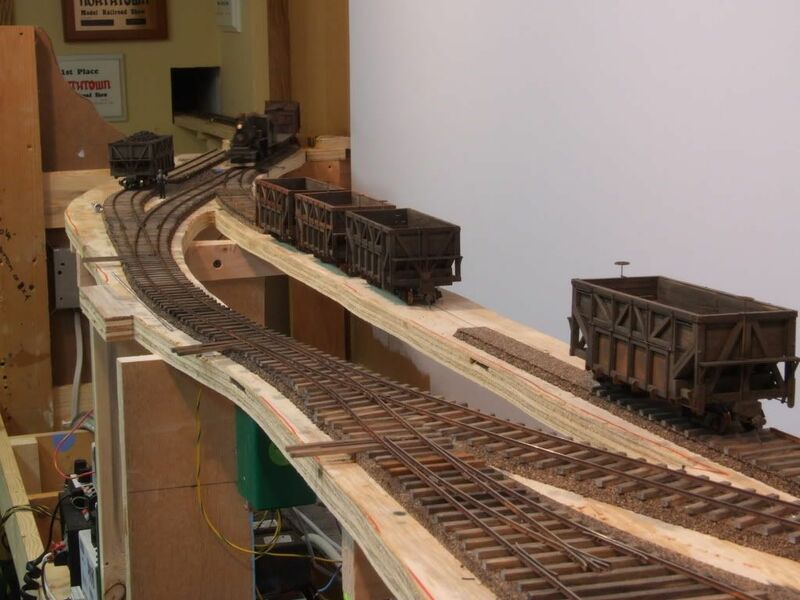 this was the first stretch of track I used the only the roller gauges on. do you mean 8 spikes per tie or did they really skip spiking a tie. I am using 4 spikes per tie, would would be one on each side of the tie and no tie plate.